I really love making goals and I pretty much make them for absolutely everything, nearly every single day. If I make a goal, I'm much more likely going to complete it than if I didn't make it as a goal. It's strange how the mind works. For example, today's goals are to update my media kit (done) and to schedule five posts (I'm currently writing up the second one). As I've made these as my goals, I'm determined to actually smash them and do more than what I wanted too; it leaves great satisfaction. One thing I wanted to do this year is to make long term goals, and even short term goals which I can complete within a few weeks or even a few months. However, these aren't going to be part of my New Year's Resolutions which you can find here, however they may be similar in one way or another. One of my New Year's Resolution's is to workout every day and so far, I have worked out every day and my thighs and bum are completely paying for it right now! Not only do I want to work out to be fitter and healthier but I'd like to lose at least 8kg of weight. If I can do this within a few months, then perfect! But if it takes a whole year then I don't mind, as long as I do eventually lose it. Since meeting my boyfriend I have put on weight, purely because when I'm with him we're more likely to eat a takeaway than cook something and this is something I want to change. 2. To not stress in my second semester. Something I really struggle with is stress. I stress over literally everything, whether it's the smallest thing in the world or the biggest. I used to stress so much I lost a lot of my hair and it became insanely thin. I'm currently in the most annoying University going. My tutors are so unhelpful and I might as well just do everything from home (to be honest, I do most of the time). My goal is to not stress when I go back to University in February for my second semester. I want to just get over the fact my tutors are useless and find the positive side of the situation and work around the problem instead of getting irritated and stressed over it. 3. To let go of anything which is making me unhappy. Although something may be making me ridiculously unhappy, I'll either keep it in my life or I'll get rid of it. But what I should really do is completely remove it out of my life regardless of what it is. This time last year I was in a job which I absolutely loved, but I couldn't stand going into work because of my manager which is what made me hate the job. I let my love for the job overpower the reason why I didn't leave and I wish I did a lot earlier on instead of waiting four months. Instead I spent four months coming home and crying instead of simply leaving. My third goal for 2017 is to throw away anything which is making me unhappy. Whether this is someone in my life or something, it needs to go. 4. To take care of my skin. This may seem like a really strange goal but it's something which I desperately need to do and also stick to. Unfortunately I suffer with dry skin and eczema and I have done since I was born. I used to stand on the kitchen chair and have my mum smother me in thick creams every time I had a bath or a shower. As I got older, she obviously stopped doing this and I never carried on and it's something which I really do not like doing. This year I want to take better care of my skin and moisturise at least three times a day if not more. I'll do it, I just need to start doing it so it becomes a routine. 5. Last but not least I want to walk my dogs more regularly. I absolutely love dog walks or long walks in general, there's no doubt about this. However I just don't walk my dogs regularly enough and I need too. Not only do I need to do this for their benefit for mine as well just so I'm walking more regularly too. Since I no longer get the train to University and I drive instead, I've definitely stopped walking as much as I used too and I'm sure it's made a huge impact on my health. I'm going to buy my dogs some beautiful coats to protect their skin as last time I walked my dog she came out in a horrible rash and I'm going to start walking them again. 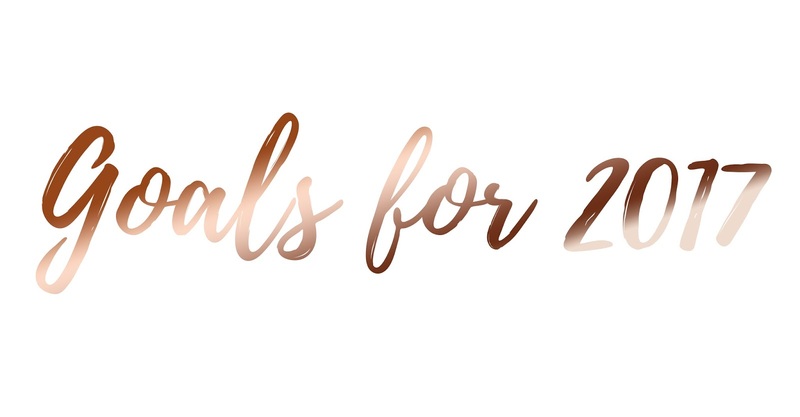 Have you got any personal goals for this year? Love your blog!!! Keep the good work! !